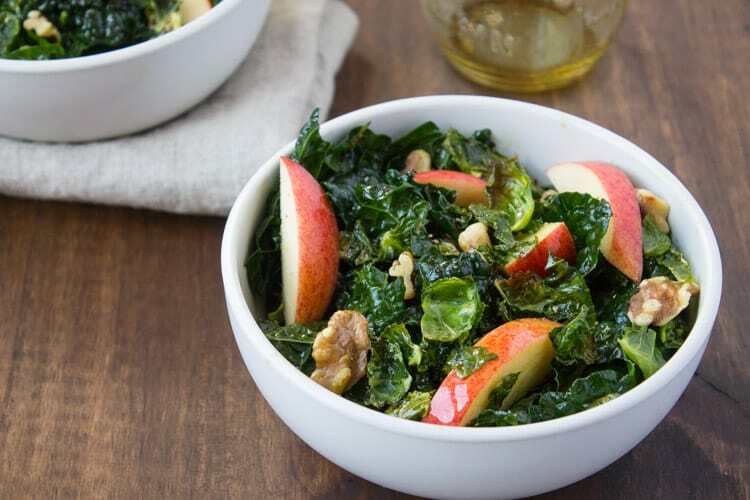 A harvest kale salad packed with seasonal ingredients and topped off with a pumpkin seed oil dressing. Perfect for a weekday lunch or as a special appetizer for your Thanksgiving menu. Ever feel like you’re in a salad rut? Or, do you have the preconceived notion that salads are BOR-ING? I’ve been in your shoes. I used to love ordering salads out from restaurants but never liked to make them myself. I always felt like they were dull. Plain Jane status. But long gone are the tired salad days. My secret to shaking up the salad bowl? Seasonal salads. Varying my salads with what’s in season seems to do the trick to keep me interested. All Summer it was arugula and fresh berries. Lately, it’s apples, pumpkin seeds, and pumpkin seed OIL. What’s the deal with pumpkin seed oil, you ask? Pumpkin seed oil is a type of unrefined plant oil. Unrefined means that the oil hasn’t been exposed to high temperatures or chemical solvents, which are typical processing methods used with refined oils like canola, vegetable, and pure/regular olive oil (not extra-virgin). This harsh processing is used to help increase the shelf-life of these oils but it also depletes their nutrients. Unrefined plant oils, like avocado, hemp, coconut, and pumpkin seed oil, are cold-pressed or mechanically extracted to avoid high heat and chemical treatment, which retains their nutrients, antioxidants, and inherent health benefits. Pumpkin seed oil is a good source of omega-3 fatty acid, ALA, and has a deep green hue. 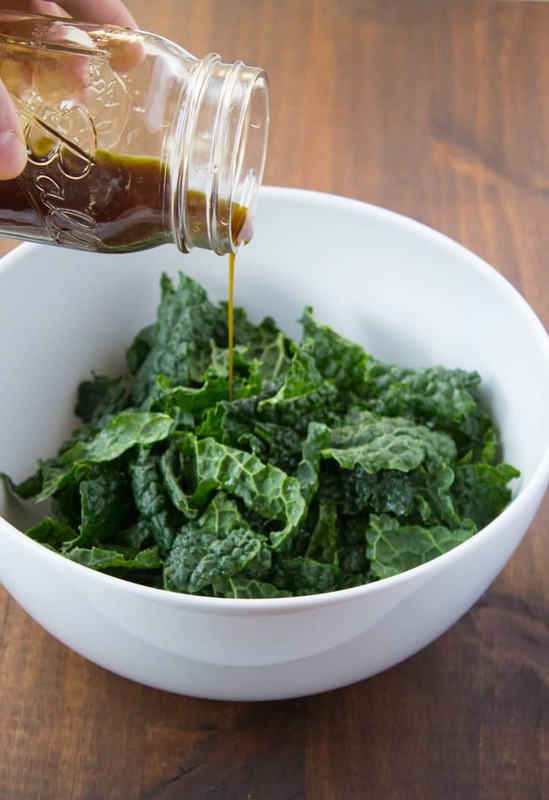 It also has a relatively low smoke point so you don’t want to heat this oil but its nutty flavor works great in salad dressings or as a finishing oil, drizzled over soups or vegetables. I store my pumpkin seed oil in the fridge to avoid any exposure to heat or light which can cause rancidity. Because I don’t have enough pumpkin in my life right now (note: one can never have too much pumpkin), I’ve been using pumpkin seed oil as my go-to salad dressing this fall. I also mentioned recently that I hate food waste, right? So I decided to make some “Brussels sprout croutons” from the leftover trimmed outer leaves from another dish with roasted Brussels sprouts that I made. It definitely added a nice salty crunch to the salad and contrasted the sweet apples pretty well. Toss Brussels sprout leaves with 1/2 tbsp olive oil and pinch of salt and pepper. Bake for about 10 minutes, or until browned and crispy. 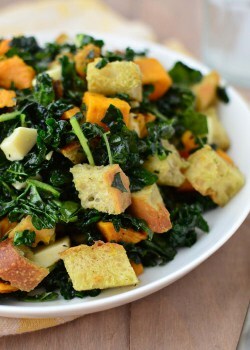 In a medium sized bowl, add kale, lemon juice, pumpkin seed oil, salt and pepper. Massage kale using hands for about 2 minutes, or until leaves have wilted down. Add walnuts, pepitas and apple. Toss to combine. Top salads off with crispy Brussels sprout leaves before serving. To toast walnuts, add walnuts to a small frying pan over medium heat. Let cook for about 5 minutes, or until lightly browned and fragrant, tossing occasionally. Tell me, have you ever tried or heard of pumpkin seed oil? What’s been your go-to salad this season? Yes, you must! I loooooove it. 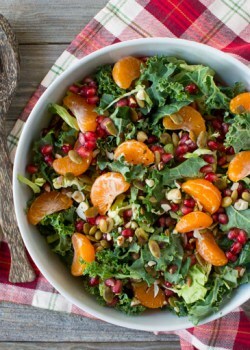 this is the ultimate fall salad! This looks so good! Pinned! I find Kale salads are a bit of an acquired taste. Its quite a shock when you first go at one as the leaves seem so much tougher than the traditional arugula etc. That said, with various ways of softening the leaves like pumpkin oils you recommend here, it makes for a really nice alternative! Do you know of any really good craft producers of pumkin oil? The brand of oil I have is called StonyBrook and I found it at Whole Foods. 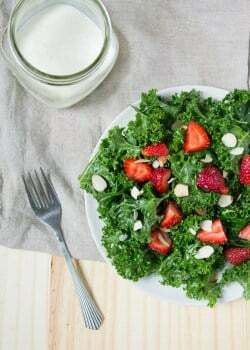 I agree that kale salads can take some getting used to but I always recommend to get your hands in there with the dressing and massage the leaves between your fingers – this will help to soften the leaves quite a bit. 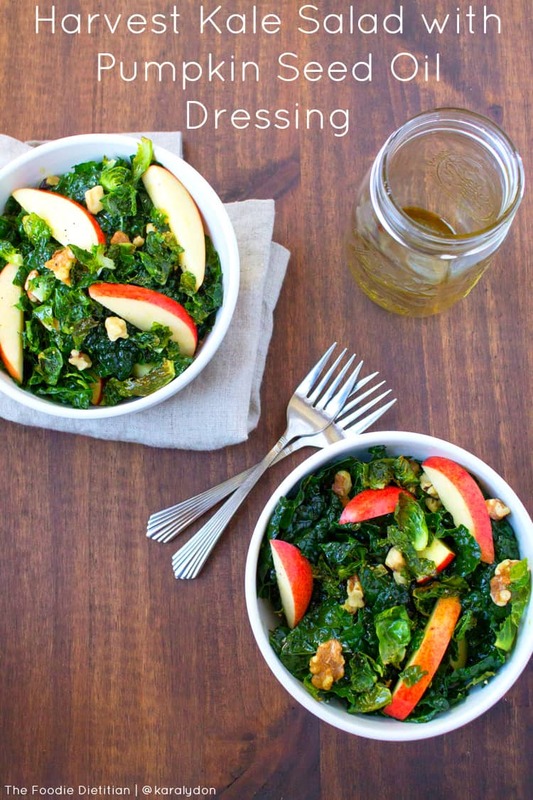 I happen to have a bottle of pumpkin seed oil in my cabinet – love the combination of kale + apples + nuts/seeds! Beautiful salad and love the addition of Pumpkin Seed Oil! This looks so yummy, and I have all the ingredients except the pumpkin seed oil but this may be a good excuse to get some and try it! Thanks, Lauren! You could always use balsamic & olive oil as a substitute but let me know what you think if you try the pumpkin seed oil! Thanks, Min! I just wrote an article about unrefined plant oils for a publication so it’s been fresh on my mind! So many great health benefits. Oh I love how you incorporated more pumpkin through your oil choice! Honestly, I’ve never tried pumpkin seed oil before but I will soon – such a great seasonal ingredient! Thanks, Whitney. I love pumpkin seed oil on salads – it brings a real nutty flavor that I love. Let me know what you think when you try it! I’ve seen pumpkin oil but I’ve never purchased it… I feel like now with restocking a pantry from scratch would be the perfect time to buy it… and make this salad! 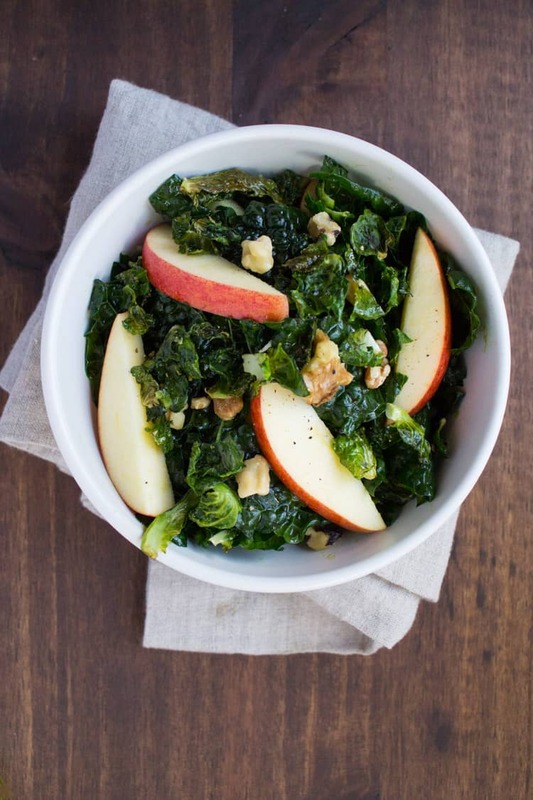 Kale + apples + nuts = love. Give it a whirl and let me know what you think, Cassie! Restocking a pantry from scratch?! Now, that’s ambitious. And so impressive! Beautiful! 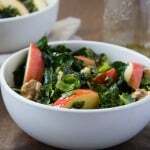 I love the crunch of crisp apples in my salads! I have been making one for lunch every weekend! Obsessed! Pumpkin Seed oil sounds lovely! I’ve seen it, but I don’t have the money to spend on it, haha! Everything about this salad makes me happy! 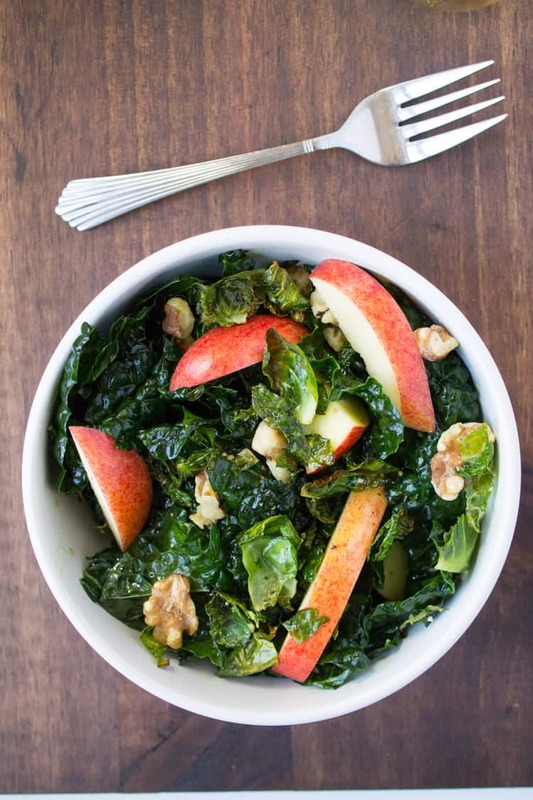 Pumpkin seeds, pumpkin oil, crispy brussels sprouts, apples, kale. How could you not want a salad if this was your option?! Looks great. Love the Brussels sprouts “croutons” idea. Those crispy leaves are the best! Thanks, Marisa. I could totally eat crispy Brussels sprout leaves all day! do u fry or bake the brussel sprouts? Hi Beth! I bake them in the oven.